Last month Poland became the first EU member state to have an Article 7 rule of law procedure launched against it. Aleks Szczerbiak writes that while sanctions appear extremely unlikely, the domestic political impact will depend on whether Poles accept the opposition’s argument that the government is isolating Poland internationally, or the ruling party’s claim that it is defending national sovereignty against EU interference in the country’s internal affairs. The Commission’s latest move shifts the ‘rule of law’ dispute to the EU inter-governmental level but no firm date has been set for member states to vote on its recommendation, allowing some space for diplomatic efforts. The Commission has also said that if the Polish government reverses its legislative changes within the next three months it could rescind its decision. However, within hours of the Commission’s announcement, Poland’s Law and Justice-backed President Andrzej Duda signed into law the two judicial reform bills whose earlier approval by the Polish parliament Brussels felt marked a point of no return. One of these potentially ended the tenure of around 40% of current Supreme Court judges by lowering their retirement age from 70 to 65, with the President deciding if their terms could be extended. The other reformed the National Judicial Council (KRS), a body that selects judges and decides how the courts are run, so that most of its members were elected by parliament rather than judicial bodies. The question of whose interpretation of the meaning of the dispute between Poland and the EU political establishment Poles come to accept will be one of the most important arenas of political conflict in the country’s politics over the coming months. While they are extremely critical of the way that the courts and legal institutions function in their country, Poles are much more divided on the merits of Law and Justice’s specific judicial reforms. They are also, on the face of it, overwhelmingly pro-EU: a December 2017 survey by the CBOS polling agency found that 85% of respondents supported their country’s EU membership compared with only 8% against. However, Poles are more wary about the idea of EU institutions becoming involved in the country’s internal affairs and are likely to be extremely hostile if they perceive that the government’s domestic political opponents are trying to settle Polish disputes in international forums. 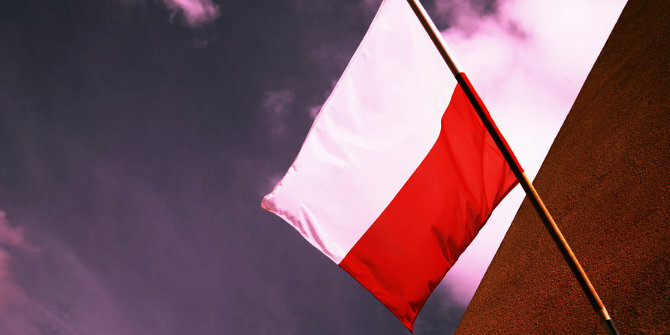 Many are also sympathetic to Law and Justice’s claim that the Commission’s criticisms of the Polish government are motivated, in part at least, by Warsaw’s rejection of what they see as the hegemonic EU liberal-left consensus in the moral-cultural sphere that undermines Poland’s traditional values and national identity. Moreover, some commentators argue that Polish public support for the EU is very broad but also rather shallow, with Poles increasingly instrumental in their attitudes towards membership. A key motivation for their voting overwhelmingly for EU accession in a 2003 referendum was the idea it represented a historical and civilisational choice to re-unite with the West and the culmination of the post-communist democratisation process. However, this idea of EU membership as a natural and obvious civilisational choice has been undermined in recent years due to an increasing sense of cultural distinctiveness that many Poles feel towards Western Europe. This issue surfaced in the reaction of Poles (and other Central Europeans) to the EU’s compulsory migrant relocation scheme developed in response to the 2015 migration crisis. An overwhelming majority of Poles oppose accepting refugees (never mind economic migrants) from Muslim countries even if Poland is threatened with financial penalties by the EU for refusing to do so. Poles, therefore, view the European integration process increasingly in terms of a cost-benefit analysis with the extent to which Poland benefits from EU fiscal transfers obviously a key element of this. How the triggering of Article 7 will play out in Polish domestic politics, therefore, depends critically on who frames the terms of the debate on this issue most successfully, and particularly whose arguments Poles find most convincing as to who is to blame for (the threat of) EU sanctions or reduced fiscal transfers. The government’s opponents will obviously continue to argue that Law and Justice’s dispute with the EU political establishment is about fundamental constitutional issues because the ruling party has violated basic liberal democratic norms. But they will also try to present Poland’s future relationship with the EU as one of the key issues at stake. They will argue that, at worst, Law and Justice is preparing the ground for ‘Polexit’: Poland following the UK’s example and leaving the EU. But they will also say that, even if the country formally remains an EU member, it could become so marginalised within the Union’s decision making structures that a process of ‘slow motion’ or ‘de facto’ Polexit will develop: with Poland progressively weakening its ties with the Union in a way that undermines its economic and geo-political interests. The government’s supporters will, on the other hand, continue to vigorously deny that Law and Justice has any plans for ‘Polexit’, while framing the Article 7 debate in terms of a defence of national sovereignty. They will argue that Poland’s dispute with the Commission is a political one and not about the rule of law, while presenting the government as the defender of Polish national interests against the EU political establishment’s interference in the country’s domestic affairs. This narrative not only solidifies Law and Justice’s support among its core voter base, it also potentially casts the government’s opponents in a negative light in the eyes of less politically committed Poles. While the government’s opponents are keen to use their close links with the EU political elites, who share their dislike of Law and Justice, to exert pressure on the ruling party by presenting it as isolated within the Union, this also leaves them open to criticism that they are themselves undermining Poland’s international standing by involving Union institutions in domestic political disputes. If the government can persuade Poles to interpret the Article 7 procedure in this way then playing the ‘rule of law’ card could end up backfiring on both the EU political establishment and Law and Justice’s domestic opponents. The EU should stop interfering in its member states internal affairs and well done to the Polish Government for refusing to allow the EU to meddle. not surprising to see bigots and jackboot authoritarians giving their support to PiS policies. as a part of the membership of the European Union, Poland has agreed to follow the Acquis Communautaire and respect its principles (rule a law, protection of minorities, liberal democracy, …). all of this the PiS party currently in Poland despise in their mad rush to write history a century back. would it be the wish of a majority of Poles (PiS got less than a 1/3 of the electorate), then they are sovereign to leave to the EU. but they don’t : neither the legitimacy, nor the will to leave. instead they want to corrupt every structure of power with their cronies. the EU is plenty right to launch their investigation and prosecute PiS policies in regards to their european obligations.